Spice it up for spring! This week has been unseasonably warm - I actually wore shorts and a t-shirt! Okay, so I was a little chilly, but I couldn’t resist the chance to get some much needed vitamin D.
I love to travel with my taste buds. Some of my favorite spices take me to exotic places. Cumin is a popular spice around the world, from Africa to the Mediterranean, and Asia to South America. It comes from the seed of a plant in the parsley family. You might see cumin commonly as a seasoning in chili powder, adobo and curry spice mixes. It has an earthy flavor and is not spicy but pairs well with spicy dishes. It is one of the most used spices in our cupboard, and we use it to season a lot of our Mexican- and Indian-inspired recipes. There are tons of recipes online for spice mixes. Here is a recipe for Moroccan Spice Blend from Epicurious that uses some common ingredients you might already have in your cupboard and can add interesting flavors for your next weeknight chicken meal. Basil is one of my favorite dried herbs to have around the kitchen. In a pinch, when fresh basil is not available, a little dried basil can go a long way. I add it as part of a dry spice rub, in sauces, stews, stir fries and salad dressings, or just simply sprinkle some on fresh tomatoes with a little olive oil for an elegant yet simple appetizer. Dried herbs and spices are just as healthy as fresh, and can be used as a replacement in most recipes. Just remember that the flavor of dried herbs and spices may be more concentrated, so you might need to use a little less if you are substituting with dried. I’d love to hear about some of your favorite spices in the comments! Enjoying a meal with friends. Last weekend it was upper-60's, sunny and bright here in Boston. That means t-shirts and shorts to many who have had to endure that long and arduous winter. For me, it meant opening day for the grill and breaking out the hammock for relaxing in the backyard! We had a fun-packed Sunday, which included working, then working out, making lunch for friends, going for a hike in our neighborhood and then hosting our impromptu first barbecue of the season! Lucky for me my friends were so kind to bring vegetables, so we marinated some tofu and chicken and my neighbor came down and made us fabulous cocktails to round it off. It was a wonderful day, and it got me so excited for more days of hiking and hanging out with good friends in our backyard. Chris conquering the last snow pile in our front yard. With spring comes spring cleaning, and I LOVE cleaning out my kitchen and feeling like I am starting fresh. Over the past few weeks I have been trying to eat my way through all of the dry foods, sauces and condiments to make sure we don't keep things around past their expiration date. I also went through my kitchen tools and gadgets to try to make room in our cramped cabinets. It was then that I thought about my Instant Pot. Even though I had been having so much fun with the pressure cooker all winter, I found I really don't rely on it, and it takes up a TON of space on my counter top (and is sort of an eyesore). I began to wonder if I really wanted to keep my Instant Pot or try to sell it on craigslist. Chris was able to convince me to keep it - he loves using any kind of technology in the kitchen - so it will live another season in the Heinen Household. But this got me really thinking about what my favorite kitchen tools are and what I could not live without. When I began making my list of cooking tools I would hypothetically bring with me if abandoned on a deserted island, I realized I rely on a small number of low-tech tools for most of my home-made meals. This might be because I was taught to cook with these utensils, but I think it is because these are essential to anyone! Fancy, expensive gadgets and contraptions are not needed to make a good chef. Rather, a few classic utensils are all that are needed to make nearly everything. Nearly. I would never willingly give up my Kitchen Aid mixer that has been in my family for 30+ years even though I only use it once a month (if that). But I'm assuming the deserted island doesn't have outlets. I pretty much use this every day, multiple times a day. I have two 10" chefs knives in my kitchen, which I use for cutting vegetables, meats, chopping garlic and herbs, cutting cakes and pies. Pretty much any reason you'd have to cut something in the kitchen I am using my chef's knife. The only things I do not use the chef's knife for is cutting bread (I have a separate serrated bread knife for that) and de-boning fish (which I don't even really do that often). If I had no other tool at all and had to only pick one for my deserted island fantasy, I would definitely bring my chef's knife. Do I mean wooden spoon you ask? Why no, I meant what I said - wooden spatula. I got one in a package of wooden utensils for our wedding (or a birthday, or Christmas... can't really remember) and I never really thought I needed so many different shapes of wooden spoons. But after a while of experimenting I am using the spatula much more than I ever imagined. It does the same work as a wooden spoon, but has a larger surface area for scraping bits off the bottom of the pan, turning wide scoops of food in a pot and can scoop a larger amount of food onto a plate when I am done cooking, which reduces the amount of things I need to wash! And of course, you can also use it as a regular spatula, but it might be too thick for things like pancakes and other small, thin foods. I first learned how critical tongs were when I worked in restaurants in New York. I was not a chef, but I saw how my chefs used them almost as extensions of themselves, like they were their fingers, gently lifting up anything in a pot, pan or on a grill. I now own two tongs - one metal and another with a silicone tip - and use them pretty much daily for everything. Grilling. Sautéing. Mixing salad greens. Stir-frying. Checking the done-ness of something in the oven just out of reach... its uses are endless! This seemingly unimportant kitchen staple has helped make almost every savory dish even more spectacular. I LOVE black pepper. I find myself blindly adding it to almost everything that is not sweet. I mean, there's a reason why waiters ask if you want fresh pepper on your entrees at restaurants! I recently purchased a Peugeot grinder and love the way it looks and grinds. Fresh ground pepper instantly boosts any dish in my opinion. When you eat as many vegetables and fruits as we do, you need a good peeler. My sister had an amazing vegetable peeler, a simple, no-frills flat peeler with a black handle, and I use it often to help me quickly prep my produce for recipes. I also recently found out the best way to prepare mangos is by peeling the skin and then slicing the flesh off the pit. Now I'll never live without a peeler (especially if my deserted island has a mango tree). A well-calibrated working thermometer is important if you want to make sure you are cooking your meats to the proper temperatures. A thermometer takes the guessing game out of cooking meats, and if you are looking to protect yourself from food-borne illnesses because you are immunocompromised, consider this tool critical. If you are interested in learning more about proper cooking temperatures, click here. Not exactly a colander, but it also works as one. And if you had to pick one tool that can separate liquid from solids, this one does the trick but better. It catches smaller pieces of food that a colander will not, and you can also use a fine mesh strainer for sifting flour, confectioners sugar or cornstarch in recipes. I love adding citrus to sauces, dressings, marinades and beverages. Citrus juices provide flavor without sodium and also give a brightness to most vegetable side dishes. Citrus cuts through the fishiness of most seafood and adds a lovely zing to homemade salad dressings. The fresh juice from a lemon or lime is so much better than concentrated juice, and a cup of fresh-squeezed orange juice adds an extra touch of love to your breakfast in bed. And if you have a reamer and want to avoid pulp or seeds in your juice, use your strainer (see #7) to keep out any pieces! This has been on my "want" list for a loooooong time. Perfect for grating fresh lemon zest (see citrus love above) or adding a dash of parmesan to finish pasta or chicken, or even to shave some chocolate finely onto the top of a frosted cake, a microplane can do the job of a grater and a zester all in one easy-to-hold minimalist kitchen tool. Consider using a Microplane for grating fresh nutmeg or ginger, garlic or anything else you want to have fine, fluffy shreds of. Ok, I know - my hypothetical deserted island doesn't have outlets! But I love my immersion blender and I have had it for almost 11 years so it is hard to give up. I find myself reveling in adoration of how fast and precise it works to blend to a pulp my soups and whip together cream for dessert. I do also have a blender and a food processor, but I often choose my immersion blender because it is so easy to clean. I don't need to muck up other equipment and attachments and spend an extra 10 minutes washing dishes instead of enjoying my soup. Sometimes it isn't just the way the tool is used, but how easy it is to use it that makes it so valuable. Now that I have shared my top ten kitchen tools with you, what are yours? I would love to hear in the comments! It’s mid-February. The snow won’t stop falling, and there’s no clear end in sight. Without being able to see the pavement how are we expected to exercise? When it’s so cold out, why would I ever trade my pajamas for spandex? Well, there are many tricks up my sleeve to share with you on how to kick off the winter doldrums and get your daily dose of physical activity! When it’s too cold outside, find a fun winter activity to enjoy. Getting a workout in when you’re doing something fun makes it so much easier to get out of bed! Activities such as snowshoeing, skiing, dancing, indoor rock climbing, spinning or yoga will keep your heart pumping and keep you warm during the cold and dark days. It’s easy to feel cold when you aren’t wearing enough layers! Treat yourself to a new pair of compression pants, a neck warmer and new running gloves if you want to feel comfortable doing anything outside. Ever since I began living in New England I have learned to forgo fashion and embrace dressing warmly in the winter. Luckily for me everyone around here loves to run in the winter and cold-weather gear is a must-have in any good Bostonian’s wardrobe. Throw together some of your favorite booty-shaking songs to a workout mix so you can keep your groove going. I love to use Spotify, which I can access from any of my devices, and I have a “pump-up mix” that I continually add songs to. Think Katy Perry, Justin Timberlake, Taylor Swift… yes I shamelessly love pop music when I’m at the gym! Sometimes I will listen to the mix in the car to get me psyched before I get there. It works! If going to the gym every day after work is just not possible for you, try to make the most of your day by fitting in fitness wherever you can. At work or at home, take the stairs or a brisk walk around the office, do a few squats wall pushups or wall sits at your desk. Some recent studies have shown that there are some serious consequences to sitting all day, including increasing risk for diseases and mortality. That Couch to 5k app will only work if you get off the couch! Find a race in your area that gives you a goal to work towards. There’s no motivation like knowing that you’ve paid for registration at an upcoming event! Looking for a bigger challenge? Check out obstacle races like Tough Mudder or Spartan Race to test your wits! You may not need a gym membership to take fitness classes. Sometimes your local community center will also offer Zumba or yoga classes at a low rate. With each class you will feel yourself getting stronger, which helps keep you motivated for the next challenging class! You can find anything online! Check out sites like The Daily Burn or Fitness Blender to give you a wide selection of different workouts to do from the comfort of your living room. YogaGlo is my favorite website for online yoga classes, and a monthly membership is the same price of a single class at the studio! On Demand will also have workout videos of the day available to you, so check with your local cable company for availability. We rarely forget to put a doctor visit or a business meeting in our calendar. Why should we treat our daily exercise any differently? If you are like many who find it difficult to stick with your plan, put it in your planner! Set time aside as you would with any other appointment and you may be more likely to remember it’s on your agenda. And remember, one hour of exercise is only 4% of your day – changing your way of thinking about this time may help you make space in your calendar for it. And then reset your goals… and then reset your goals... Never stop setting new goals! Make sure your exercise goals are specific, measureable, timely and attainable – if you don’t think you can physically achieve something – such as running a half marathon for the first time next month – then find a goal you are able to achieve. Maybe try running a 5k next month, and then a 10k… you get the idea. If you don’t think you’ll actually go to the gym because you hate the treadmill, then pick a more fun activity (see tip #1). And when you’ve accomplished that goal, set a new one to keep you challenged and interested in staying active. I hope these tips help you find ways to get more movement in your day. Do you practice these already or have any other tips I didn’t mention? Drop me a line in the comments! I am a planner. When I was younger I wanted to be a wedding planner (thank you, J. Lo) and when I got older I thought I do a really great job as a project manager. I live by my Google calendar and Clear, and I love setting 5- and 10-year plans. When it comes to vacations, I usually take the helm at figuring out where we go and what we do. Call it what you like, my propensity for planning is part of why I am sometimes lovingly referred to as “Type-A”, but it also is one of my strengths, especially when it comes to feeding my family healthy foods. Write a list of the week's nightly plans to get an idea of how many meals you should plan ahead of time. Planning meals in advance is one key to a healthy diet. It all starts with taking time to think about what you are eating, which is something many people will say is not easy. Especially with family, house chores, work and social obligations, it can be one task that gets put off until too late. You will soon realize that on the days and weeks you have not been able to plan meals it is easier to cut corners, order takeout, make a frozen pizza or whip together blue box mac and cheese. Use a meal planning template to help you write down your ideas for the week's meals. You can make one yourself or purchase one like this, made by Knock Knock Stuff and available for purchase here. One day a week my husband and I discuss what our schedules look like and decide what days we will be cooking at home. This usually is on a weekend when we have the time to sit down together! If we know that we will be eating at home 4-5 days out of the week we will try to plan 4-5 meals. If you know you have a busy day and may not have time to cook, you can plan to make extra for leftovers or use a super fast and easy recipe that night. Protein keeps you feeling satisfied and prevents you from reaching in the cupboard for a late night snack. Look at your local grocer’s flyer for coupons or what is on sale that week to get your creative juices flowing. 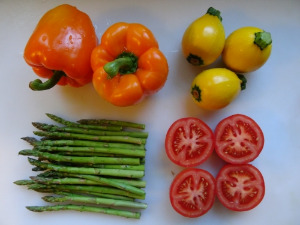 Eating seasonally makes meals interesting and prevents boredom from using the same ingredients every week. Sometimes these foods are also on sale! If you can’t get fresh ingredients, frozen can be just as healthy and usually very affordable. Put that Pinterest to good use! Save recipes you think look delicious and easy to your email, Pinterest, Evernote or just print it out and keep it on hand. Add the recipe to your weekly meal plan. Who knows, it may become a family favorite! If you aren't feeling particularly motivated, reach for the recipes that are always a winner and usually take less than 30 minutes to prepare. Keep a list, highlight them in your food journal, or file them under “easy” in your recipe box - whatever you do, keep them handy! On days you don’t want to think about dinner you can quickly pick a reliable recipe you've already mastered. Save money, reduce waste and make your grocery trip quicker by writing down what you need to purchase. There are hundreds of apps you can use, or good ol’ pen and paper will do! I have been doing this for years but didn't even realize it! Lifehacker has an article that suggests using a box to put food into that needs to be eaten soon. I usually organize my meals by shelf in the refrigerator, and keep my “soon to be expired” foods at the top shelf. This will help you know what ingredients you need to use up in your next recipe and prevent waste! Pre-cut veggies, mix marinades, or purchase cut fresh or frozen veggies to reduce barriers to cooking healthy foods during the week. The 30 minutes you spend on Sunday night can expedite the process during the week and reduce the feeling of burden. Have a surplus of chicken but don’t want to eat the same dish all week? You can re-purpose most foods into other recipes, such as grilled chicken into chicken salad, sandwiches, chopped and put over a bed of greens, tossed with spaghetti… so many options! Doing this will speed up your meal prep throughout the week and can help reduce waste. I hope these tips help you stay inspired and make meal planning easier! Do you have any tips for meal planning? Let me know in the comments!